I'm a starry-eyed 20-something with two cats and too many hobbies. Let me take you back to another time. A time when men wore suspenders, fedoras, and wing tip shoes (um, has anyone got a fan? ), and women wore gloves and pillbox hats. It's the 1920s and swing dancing is just about to become the grooviest activity around. Luckily you don't need to understand jive talking to enjoy swing dancing, and Brisbane has a great swing dancing community so you can jump right in. Swing dancing began in the 1920s, and popular styles include the Lindy Hop (which is accidentally named after Charles Lindbergh after he made his historic flight from New York to Paris), Charleston, Balboa, and Blues. It is danced to jazz, or swing music (think Benny Goodman, Count Basie, and the Andrews Sisters), and if you think that's not necessarily your style of music – let me tell you, it grows on you very quickly. It's important to note that although swing dancing began in the 1920s, it hasn't stayed there. 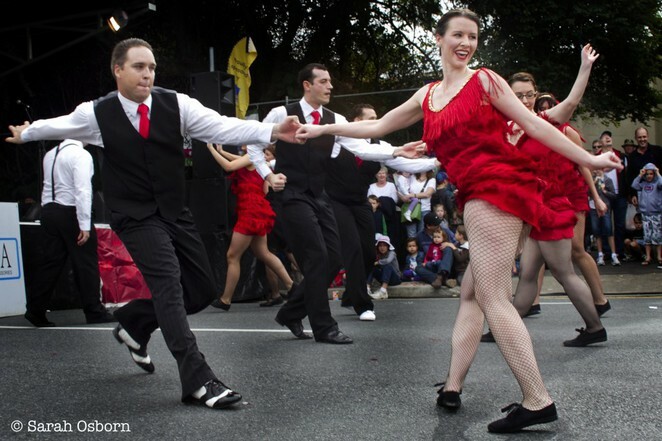 This style of dancing is attracting more people every year, and in May, swing dancers all around the world performed a Shim Sham (basically a group routine) in memory of swing dancing legend Frankie Manning. I'm about to tell you the most important thing about swing – anyone can do it. I'm saying that as a girl who's all elbows and knees, so you know it's true. Sometimes when you're learning all you can do is hold on and smile a lot; and that's the secret to swing dancing. The technical term is 'moxy'; that is, it doesn't matter what you do - if you do it with attitude, you're doing it right. I've even seen long-time dancers complete a tricky-looking aerial and then trip over their own feet on the basic step. Have I turned you into a jitterbug yet? Translation: swing fan. If I have, let me tell you about the hippest places in town to get your dose of swing. Swing Shack is run by Empire Swing, and runs every alternate Friday. It begins with an Ultimate Beginner's Class at 7:30pm, which gets you rock-stepping into the social dance part of the evening from 8:30pm. This is a great swing dancing taster, and you'll get to see the beautiful fashions from the dedicated dancers as well. Don't worry if you don't have a partner, the beginner's class is progressive and everyone is friendly so just look interested and you're sure to get a dance during the social. When: Fortnightly, Beginner's class at 7:30pm, check ou www.empireswing.com.au/local-events/ for dates. Swing at the Oasis is run by Gotta Swing, on the third Saturday of the month, at Broadbeach Mall on the Gold Coast. Once you've been to one of these events and found your new addiction, you can sign up for a beginner's block of classes to refine your skills. Empire Swing has classes in Paddington, Fortitude Valley, and Woolloongabba. Gotta Swing has classes in Salisbury, and Helensvale. Once you've been through the beginner's class, you can head to one of the events that occur throughout the year, including picnics, workshops, balls, and other sundry treats. If you were cool (hep), you might have been warming up with the band (frisking the whiskers) while you waited for your girlfriend (main queen) who was flirting (gammin') with another guy (jack). New swing dancing school has opened in Brisbane. Corner Pocket Swing cornerpocketswing.com.au run classes and socials across Brisbane.